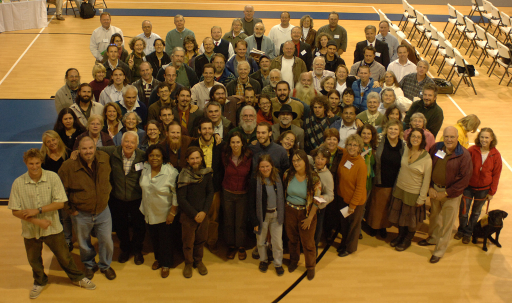 I’ve just returned from a five-day workshop in Hohenwald, TN, a remarkable and inspiring event that sought to provide both an introduction to “financial permaculture” and the launch of several new enterprises – including a green incubator – in rural Lewis County (population <15,000). Lewis County was once a self-sufficient agricultural area, with a small number of exclusively local businesses – but no longer. Now over $20 million flows out of the county annually, much of it for food and other basic items purchased at the “local” WalMart supercenter. Official statistics list only 63 families and individuals earning a living from farming. An hour or so southwest of Nashville, Hohenwald, a town of less than 4000 that is the county seat, has a few unique characteristics: a museum devoted to Meriwether Lewis (of the Lewis and Clark Expedition), an elephant preserve, and a county museum of local and natural history. Lewis County seems, at least on the surface, a pretty classical small-town conservative area, with 42 churches for a population of around 15,000, and McCain-Palin signs seemingly running about 20:1 over Obama-Biden. (One of the members of our finance team, noticing a prominent sign that said “Stop Obama tax increases,” remarked that only four people in the county were reported to have the incomes of over $250,000 that would be affected). At the same time, we were welcomed by some dynamic and very progressive individuals, including the Town Mayor (who had just learned of plans to site a toxic waste dump near the town, supported by the County Mayor), a passionate church school principal and pastor, a knowledgeable local realtor, and some dedicated back-to-the-land folks who were surprisingly sophisticated in internet technology, documentary film-making, and logistical coordination, while maintaining a down-home warmth and friendliness that surpassed even the classic notion of southern hospitality. The financial permaculture portion of the workshop, led by Catherine Austin Fitts of Solari, Inc., a former Wall Street executive and assistant HUD Secretary who has become an outspoken critic of what she calls “the tapeworm economy,” was devoted to describing the many ways in which our current financial system is destructive, inextricably linked to criminal behavior, and fundamentally unsustainable; and to brainstorming whether it might be possible to refocus investment into local sustainable economies. The work of her group is still clearly preliminary and remains at a rather abstract level, partly because of the inherent complexities of conceptualizing a mechanism for attracting equity capital to small local enterprises, and partly because of the legacy of a nearly-decade long legal battle with the feds over an information system designed to follow the real flows of money in a community – the result of which was essentially the suppression of the system and an understandable hesitancy about challenging the vested interests that feed off the mainstream economy. I found this whole analysis very intriguing but ultimately insufficient to ground the very practical local enterprises that it intends to support. It is getting a greater recognition lately as part of the foundation of the “transition towns” movement in the UK and Europe, but it has not been widely applied to business or financial systems. As a design philosophy, however, the principles should be applicable in business as well as in other fields. Its core values are EarthCare, PeopleCare, and FairShare – recognizing that the world’s resources are limited and need to be used equitably and for the benefit of all. Alongside this we engaged in some very intense venture-development work, breaking into teams of 25 or so and trying to develop complete business plans and “pitch” presentations for enterprises in four different sectors: green incubation, food and farming, building and salvage, and biofuels. Even though these were chosen on the basis of expressed interest from a list of more than twenty business ideas presented to the community, we were somewhat hampered by the lack of local participation and knowledge. In the end our presentations (to a stakeholder panel of local and state notables, regaled with a natural, organic, vegetarian lunch) were a little hurried and unpolished, but showed great promise. It is likely that continuing efforts will be made to get some of these local enterprises off the ground and fund the incubation project. I’ve applied for a grant to follow up and assess the process for replicability around the world. While local circumstances vary, the need to create sustainable enterprises is critical everywhere, since we are in a race to save our species – from what many may feel is well-deserved extinction – and build an enduring world for generations to follow. The core team has agreed to host a follow-on event next year, to see and to support the progress that has been made. There were also a couple of very interesting models of “virtual farmers’ markets,” using the Internet, at locallygrown.net and Oklahoma Food Coop, that I think are worth trying out here; and a new way of urban farming, at www.spinfarming.com.